Dartmouth appealed to Keniston because of its highly competitive nature and scenic location, he said. He added that these assets afforded him unique opportunities and challenges — such as dealing with a heating plant for subzero temperatures — that would not be present at other institutions. According to Mills, he first met Keniston when the former consultant was working on the restructuring of Geisel School of Medicine, as the medical school was struggling with growing deficits. Mills subsequently helped bring Keniston to Dartmouth’s campus in a more permanent role. 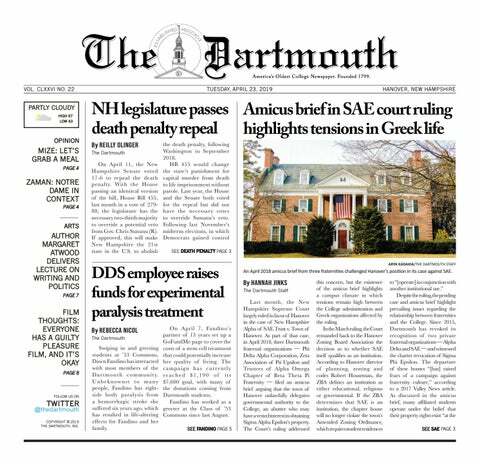 According to Keniston, his new position as vice president for institutional projects demonstrates the evolution of his involvement with Dartmouth. Mills said he initially hired Keniston because he needed someone to serve as the executive responsible for overseeing the institution-wide projects that span multiple disciplines. As vice president and chief of staff to Mills, Keniston worked to oversee and coordinate projects that overlap with several divisions, he said. For example, Keniston has helped to progress the Dartmouth Green Energy Project, the College’s plan to improve the efficiency of its energy production and distribution systems and reduce its greenhouse gas emissions. To accomplish this goal, Dartmouth has partnered with Goldman Sachs to utilize their expertise and resources. The sustainability project focuses on three elements: steam to hot water conversion, a new biomass generation facility and the operation of the current generation facility. Over the next 18 months, Keniston will continue to work on the Dartmouth Green Energy Project in addition to other ventures, such as the expansion of graduate student housing. Keniston said he hopes to continue the progress being made in updating the College’s facilities and infrastructure. Ritu Kalra, a managing director and head of Goldman Sachs’ non-profit higher education, said that Keniston has a “unique role” at the College and that Dartmouth is lucky to have him. Keniston became involved in higher education when he served as a voting member on the board of trustees at Ithaca College as an undergraduate. After receiving his degree from Ithaca, he earned his master’s in higher education at Harvard University.